We're a family run chandlers based in Mylor Yacht Harbour, near Falmouth, Cornwall . Formed in 1985, we have grown into one of the largest chandlery & rigging businesses in the South West of England. A large and varied stock is carried ranging from all the items needed to build or refurbish any craft of any shape or size. Whether you need the latest in high-tech paints and sealants, new heating systems right down to the smallest nuts and bolts. We will happily send online orders anywhere in the world. 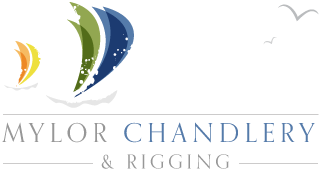 Along with the rigging department we offer the dedicated support and commitment of a highly experienced team with over 40 years of experience between them in the Marine Industry. Mylor Rigging are area agents for all the major marine suppliers. * Spinnaker Poles in carbon or aluminium and much, much more. Our strength lies in the very broad base of expertise we have in rigging and masts, covering dinghies, dayboats, cruisers, race boats and super yachts. Have a question? Simply telephone us on: 01326 375482 to discuss your requirements.